Miami, FL (May 2016) In June, acclaimed business expert and Chief Revenue Officer for Beasley Media Group, Heather Monahan, will launch her namesake website aimed at empowering females in their careers and beyond. Building upon a motto of “empowering women to succeed by celebrating their strengths and utilizing what makes them unique,” www.heathermonahan.com will give women the necessary tools for building sustainable success. Utilizing The Monahan Method, which features tips on everything from professional attire to resume writing, balancing a career with motherhood and plenty more, Monahan seeks to empower a whole new generation of female professionals to achieve the same levels of success she has. Monahan’s rise to success began at Clark University in Worcester, MA, where she earned a Bachelor’s in Psychology. Eager to achieve financial success and stability, the eager upstart quickly rose through the ranks of Gallo wineries as a brand manager before eventually finding her path in broadcasting. “Early in my career, I set out to find what would make me money quickly, but found instead that there was so much more available in life beyond chasing money. I spent years trying to redirect, to find my passion and true purpose for myself and my career,” she says of her early days of as a professional. As a single mother in the midst of a successful career, having risen from employee to executive, the acclaimed media executive is on a one-woman-mission to share her 360-degree experience to inform other women on how to best approach the job force and understand how to holistically set themselves up for success. Transparency around her struggles as a single mother, as well as her own life challenges and successes, allow Monahan to connect with women, celebrate their attributes and teach them to leverage these traits in their favor. 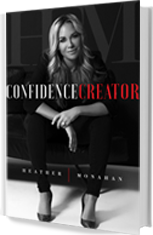 By utilizing www.heathermonahan.com, she hopes to help women learn to embrace their inner powerhouse so they, too, may be unstoppable. In addition to her career as a prominent female media executive, Heather Monahan serves as a board member of City Year Miami where she helps provide leadership for at-risk youth. For her achievements in broadcasting and multi-media marketing, she was also selected by the National Association of Broadcasters (NAB) and Radio Advertising Bureau (RAB) as a member of the steering committee. Most recently she was honored as a recipient of the 2015 Glass Ceiling Awards by the Florida Women’s Conference recognizing her leadership excellence in the workplace and also selected to be a member of the FIU Engagement Advisory Council to further serve as a mentor and leader in the South Florida community. Not simply focused on success, Monahan abides by a keen desire to give back to those who have helped her along the way. “If I can only give one piece of advice, I would have to tell young professionals to learn from my early experience and subsequent failure,” she says. A career-long search for passion and strength as a female in an industry dominated by men has allowed Monahan to become a voice for female empowerment, a key tenet of her current career and the launch of her new website. For those who have already worked with Heather Monahan, her energy, her methods, and her experience are second to none. “Heather challenges me on an ongoing basis to own it, to be it, and to dream it. She pushes me when I can do more, be more, and achieve more, and she does it with a smile and grace. How does she do this? She asks the tough questions, she gently suggests, and then she blatantly challenges the norm,” says Lisa Schwarzberg, a private equity executive and former colleague of Monahan’s. “She challenges me to take risks, to think a little harder, to want a little more, and to push myself further to be a better me.” Now with a website, anyone looking for tips to thrive within the professional sphere will have The Monahan Method readily at hand. For additional information please visit www.heathermonahan.com.